Keep the home warm during those cold, winter months. With our baseboard heaters, towel radiators, and baseboard covers, we have the heating and decorative options you need. Baseboard heaters supply heat via hydronic (heat produced with water) or electric baseboards. It is necessary to calculate the required baseboard size and parts before beginning an installation project. We offer a variety of hydronic and electric baseboard heaters manufactured by premium brands, including SlantFin, Runtal and QMark. 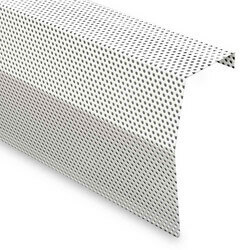 SlantFin Baseline 2000 baseboards are ideal for heating in tract housing, apartments and renovations. All end caps must be purchased separately. SlantFin Fine/Line 30A baseboards provide gentle full room convection heating that blocks chilling drafts at the outside walls. Fine/Line 30 baseboards are ideal for high quality installations in homes, apartments and many light commercial applications. 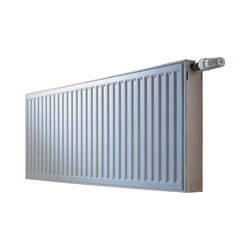 SlantFin Multi/Pak 80 is an ideal choice for deluxe residential heating or for a broad range of light commercial heating requirements. With a choice of heating elements for hot water or steam systems, Multi/Pak 80 is built with hefty brackets and an 18-gauge front panel. 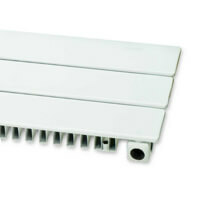 Runtal baseboard radiators are attractive, durable, and comfortable replacements for fin-tube or cast iron baseboards. They can be used as a radiant alternative or complement to electric, radiant or hydronic floor heating systems. Qmark Electric baseboard heaters and Cadet Electric baseboard heaters contain a sheathed electric heating element completely immersed in a heat transfer liquid and sealed in a heater-length copper tube. This maximizes the volume of heat storage fluid to prolong the thermal constant of the entire heater. QMark electric baseboard heaters can be found in residential homes, apartments, mobile homes, commercial, industrial, and institutional applications. 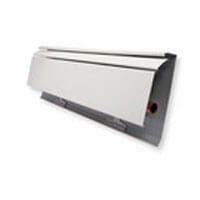 Do you sell Slantfin baseboard in lengths over 8'? 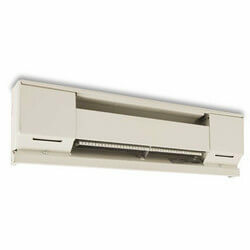 Answer: Unfortunately we don't sell baseboard heaters in lengths over 8' because they get damaged too easily. What do the Slantfin baseboard heaters come with? Answer: The Slantfin baseboard heaters come with the heating element and fins and the enclosure. However, they don't come with end caps. 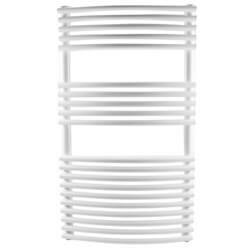 Baseboard heater endcaps can be purchased separately. Some of the Slantfin heaters say cover only, what does that mean? Answer: Slantfin baseboard that says cover only does not contain the heating element. 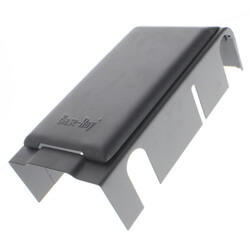 These are used to replace existing baseboard covers.